FAQ: Is the Reboot Master 6000 sold in department stores and retails shops? A: In order to keep our operating costs low and sell the juicer at the most competitive price, we only sell online and from our warehouse/service center in Chiangmai. We deliver all over Thailand by Kerry express courier company. We offer cash on delivery, bank transfers, paypal and credit card payments. We also offer installment plans for certain credit card companies. 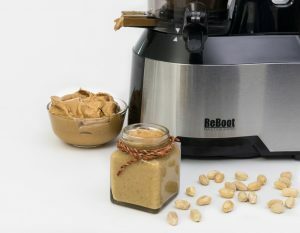 Q: What is the warranty for the Reboot Master 6000 juicer? How do you offer after sales service? A: We offer 5 years warranty for the motor and 1 year for other parts. Our service center is located in Chiangmai. For warrranty on the motor : The customer can send the motor base to our service center in Chiangmai. are proud of having one of the fastest repair services available. Because of our in house repair service we execute all repairs within 1-2 working days and will send the machine return to the customer right away after repair. For warranty on other parts than the motor: All the customer have to do is to take a photo of the damaged part and send to us with a description of the problem. For damage covered by the warranty we will send a new part free of charge. We are the exclusive distributor of this model in Thailand and we do have all parts in stock. Q: What if my goods are damaged from delivery handling on arrival? the goods and we will send a new replacement machine free of charge. Q: How to assemble and use the ReBoot Master 6000? A: We supply an English language user manual for non Thai customers and we have a youtube video that shows how to assemble Click here to watch the assembly video The THAILANDJUICER youtube channel also show other videos related to the juicer and the ozone cleaner. Q: Is the ReBoot Master difficult to clean after use? Q: Where is the ReBoot Master 6000 produced? A: The ReBoot Master is sold in over 40 countries all over the world under different brand names. with the extra large feeding tube for easy and fast juicing. It have now been on the market for almost 3 years. It is made in China in a ISO 9001 and SGS certified production facility. The special Ultem plastic super durable resin used for the juicing screw and the juice strainer is imported from the US, the brush less AC induction motor technology is German. Q: What can the ReBoot Master 6000 be used for? Why it is called a multi function slow juicer? A: The ReBoot master 6000 slow juicer comes as standard with a juice strainer and a blank strainer (sorbet strainer). A smoothie strainer is sold as an extra accessory. Using the 3 strainers the machine can make juice, smoothies, nut milks, nut butters and sorbets/ice cream. Click the THAILAND JUICER youtube channel link here below to see some samples of what the machine can do. Q: Is it better to drink fruit/vegetables juice than eating the whole fruit or vegetable? A: Drinking the juice instead of eating improves the speed and efficiency of the absorption of the nutrients in the produce. When drinking, the nutrients can pass directly into the blood vessels in the intestines securing a quick and more efficient absorption. Many vegetables and fruit cells bound in fibrous material can not be 100% digested in the stomach and some nutrients gets lost. It is also difficult to eat fruits and vegetables in bigger quantities as the fibers will make us feel full. Many ingredients are not very pleasant to eat, such as some of the most beneficial plants we have; fresh ginger root or fresh turmeric root, but mixed in some juice they taste quite pleasant. Try apple juice with a bit of ginger root for example…. We do not recommend big of amounts of sweet fruit juice though. Even the juice is natural and freshly made, it still contains a lot of fruit sugar which is not good for the blood sugar levels in our blood. With the amount of residual pesticides still present on fruits and vegetables in Thailand, this makes juicing a more safe way of consuming. Q: Can the Reboot master 6000 be used in a juice bar? / How long continuous use? A: The machine can be used in juice bars. The silicone juice bowl seal should be changed on a regular basis when used for heavy duty work as there is a constant friction between this seal and the steel axle on the juicing screw which creates some wear and tear on the seal. When a bit of juice starts leaking under the juice bowl it is an indication that the seal should be changed. The seal can be purchased in the website shop. The Reboot master can be operated continuously for 30-45 minutes. There is a built in overheating switch which will turn off the motor when it gets hot. After 15-20 minutes the machine can be operated again. The machine will only overheat when used continuously. If doing a longer juice session with small stops for emptying the juice jugs and preparing ingredients normally the machine will not stop due to the action of the over heating switch. Q: Do you supply recipes for use with the juicer? Q: Why the machine sometimes is making a squeaking noise during operation? A: Some hard ingredients such as apple, beet root and carrot when being pressed between the juicing screw and juice strainer/juice bowl can make a squeaking noise. This noise is caused by vibrations from the pressing action and not an indication of any problems with the machine. Q : Why sometimes the pulp being ejected is not dry? A: Some ingredients that are not fresh or too soft, such as old apples, oranges, guava and beet root, can make it difficult for the machine to press out the juice. This is caused by the cell membranes in the juice being more elastic and sticky. So when pressure is applied to the ingredient the cell membrane stays intact instead of breaking and letting out the juice. This can partly be helped by cooling down the ingredients to be juiced in a refrigerator before juicing. To increase the juice yield and quality try always to use fresh ingredients for juicing and if possible cool them in a refrigerator before juicing as it will aid the juicing process by making the juice cell membranes more “crisp” thus producing more juice and less wet pulp. 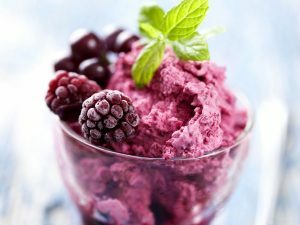 Q: Can the juice machine make ice cream and what products can be made with the blank strainer? A:Yes, the machine can make ice cream, sorbets and nut butters with the blank strainer. Please look at our recipe menu for recipes. You can search specifically for “BLANK STRAINER RECIPES” in the search field in the RECIPE menu of the website. Q: How to use the smoothie strainer? A: The smoothie strainer is used to make juice/smoothie for which the pulp is not extracted. 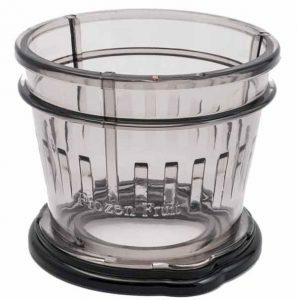 Please note the smoothie strainer is the gray color plastic strainer with stainless steel strainer mesh as shown in the video below. The smoothie strainer does not have a pulp extraction outlet and both juice and pulp is forced out of the strainer holes. The strainer holes in the smoothie strainer is about 3 times bigger than in the juice strainer. This allows pulp/fibers to be forced out through the strainer holes as well. The smoothie strainer is suitable for oranges, banana, avocado, strawberry, mango, cantaloupe. A liquid such as milk, yogurt or water should be added. Ice cubes can not be added to the feeding tube, but the ingredients can be frozen before processing if an icy cold smoothie is desired. 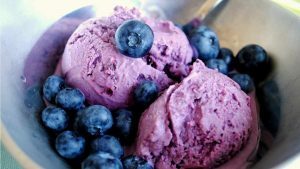 Before processing frozen fruit they should be cut into smaller pieces and liquid should be added with the ingredients through the feeding tube. Q: Why does the juice separate into layers? A: As juice made in a slow juicer is not filtered 100% for fibers (pulp) same as juice sold in a carton at the super market, the layering will occur after a while because of different density of the fibers and the juice liquid. Sometimes there can be more than 1 layer. As no stabilizer chemicals is added sometimes different parts of the juice can have different colors even in areas with no pulp. This is normal for raw natural non filtered juice. 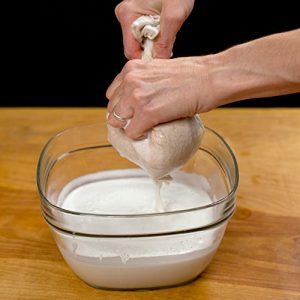 If you don’t like any pulp in the juice at all you can remove any remaining pulp by filtering the juice in a nut milk bag. To be able to keep the juice longer we recommend to refrigerate ingredients before juicing and to add ice cubes to the juice right away after finishing the juicing. Adding a bit of lime to the juice also helps to keep the juice longer as the lowering of the pH inhibits growth of bacteria and yeast naturally occurring in the juice. Q: Why sometimes my orange juice is bitter? A: Some types of orange contain many seeds. The seeds contains a bitter liquid that will be pressed out during the juicing process. This can cause the juice to get a somewhat bitter taste. If the oranges contain many seeds we recommend to remove the seeds before juicing. For juicing try to select oranges with few seeds. Some types of orange contain enzymes that make the taste of the juice change after a few hours. This does not mean the juice is spoiled but for some this taste is not desirable. Q : What kind of fruit seeds can not pass through the machine? A: Some fruits contain seeds that are either too big or too hard to be processed by the ReBoot Master 6000. This can cause the juicing screw to get stuck and/or cause damage to the juice strainer. We recommend not to juice fruits which large hard seeds such as tamarind, cherry, plum, peach, apricots etc. as they will cause damage to the machine and some of them also cyanide. Apple seeds can be juiced as they are small and soft, but if consuming large quantities of apple juice we recommend to remove the seeds before juicing as they contain small amounts of cyanide. Q : Can the ReBoot Master 6000 make soy bean milk? Q: Can the juice machine make corn milk? Q: Can I make almond milk with the ReBoot Master 6000? Q: What should I do if the juice yield is getting low? 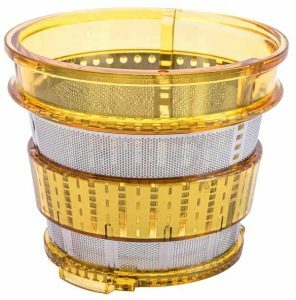 A: If the machine have been making a large quantity of juice, fiber will eventually get stuck on the juice strainer and the juice can not pass the small mesh holes anymore. When this happens the juice bowl needs to be removed from the juice base and the juice strainer, juice bowl and juice screw needs to be cleaned. To avoid heavy build up of grime and fiber on the juice strainer it should be cleaned immediately after finishing each juice session using the cleaning brush that comes with the machine. Letting the juice strainer dry up makes it a lot harder to clean. 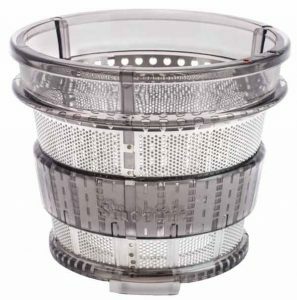 If the juice strainer mesh holes get filled with fibers that are hard to clean out, we recommend to use a mixture of house hold chlorine (Haiter) and water in the ratio of 1:2 to soak the strainer over night. Use the cleaning brush occasionally and repeat until the strainer is clean. The chlorine will dissolve the fibers and grime. A: For a long term problem free use, the machine should be cleaned immediately after each use to avoid the ingredients drying and getting stuck on the juice parts. This will make it harder to properly clean the juice strainer and juice screw. 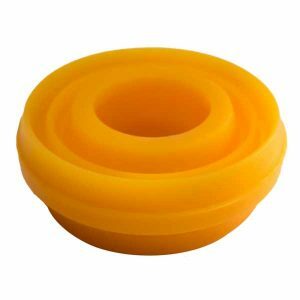 For heavy users such as juice bars and other juice sellers that operate the juice machine all day, the silicone juice bowl seal should be checked for leaks and if any bigger leaks occur the seal should be changed. Leaks will show as small drops or puddles on the top of the juicer base. Replacement seal can be ordered in our website shop.